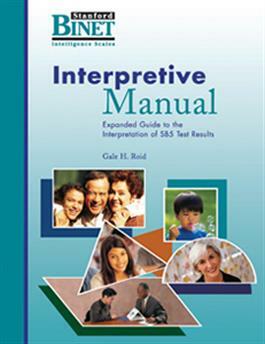 The Interpretive Manual provides detailed guidelines for the effective interpretation of the SB5 for a number of applications, including its use by psychologists active in school, clinical, and counseling settings. Case studies, profile analyses, and SB5 Scoring and Report System reports provide concrete examples of interpretation. This manual also introduces an Extended IQ (EXIQ) scale that supports the calculation of Full Scale IQ scores substantially lower than 40 (e.g., to an IQ of 10) or higher than 160 (to an IQ of 225).